Over the past seven years, Marvel fans have become accustomed to sticking around as the entire credit sequence rolls, for a sneak peek at either an upcoming Marvel Cinematic Universe project, or sometimes just a fun bonus scene. Many might not even know what shawarma is had it not been for the memorable end credits scene in 2012's Marvel's The Avengers, but sitting through the credits also gives one a sense of just how many people need to come together on movies of this sort of magnitude. Many of these men and women aren't household names like the actors who play Earth's Mightiest Heroes, but they are just as vital to the success of the film as the actors or writer-director Joss Whedon. Before Avengers: Age of Ultron debuts on Blu-ray 3D, Blu-ray and DVD, I recently had a chance to speak with one of these unsung crew members, stunt coordinator Greg Powell, who helped bring all of the massive fight sequences to life. Greg Powell has been a stuntman for the past 45 years, working on classics such as Indiana Jones & the Temple of Doom, A View to a Kill, In the Name of the Father. He has also served as stunt coordinator on every Harry Potter movie and other hits such as Mission: Impossible, The Da Vinci Code, Fast & Furious 6 and last year's Hercules. Avengers: Age of Ultron marks his first superhero movie, but after some of the memorable action sequences in the sequel, don't be surprised if you see his name in the credits in future MCU movies. This unique profession runs in Greg Powell's family. His father, Nosher Powell performed stunts on early James Bond films like From Russia with Love, Goldfinger and For Your Eyes Only, along with classics such as Lawrence of Arabia, The Longest Day and The Dirty Dozen, just to name a few. Take a look at what Greg Powell had to say about when he first realized he wanted to be a stuntman, his work with the incredible cast on Avengers: Age of Ultron and much more. I've always been fascinated by stuntmen and stunt coordinators and what you guys do. I know there are stuntmen in your family, but when did you realize that this was something you wanted to do? Greg Powell: I think it was one of the early James Bond films. I think I was probably eight or nine, and I used to go down there with my father. I used to run around, getting teas and coffees for all the other stunt guys, so it goes way back to then. 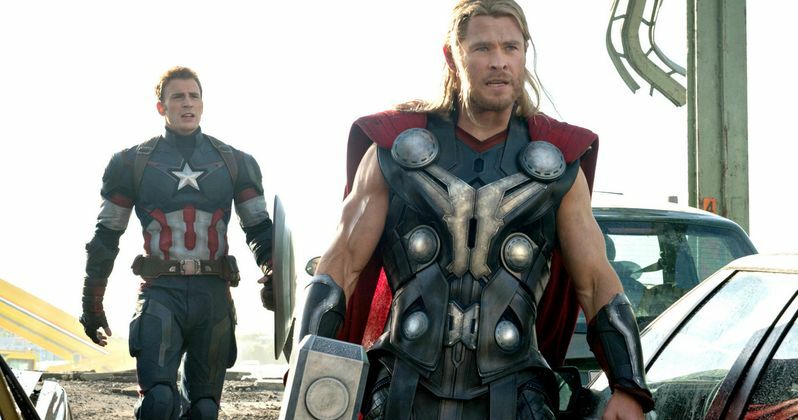 Can you talk about what made Avengers: Age of Ultron so special for you? The opening scene alone was just so incredible. Was there something that stood out to you when they presented the project? Greg Powell: Well, Marvel has been very successful with their stuff, and I've always admired the stuff that they've done. To be asked to do Avengers: Age of Ultron was really something else. After the success of the last one, which was Marvel's biggest picture, it was an honor, really, to do that. To work with everyone and the actors was just fantastic. How much time do you get, ahead of shooting, to prepare and get your stunt performers ready? Greg Powell: I actually had about three months, before the film actually started shooting. It was a few months before Christmas and into January, to get stuff prepared, but even when the film starts, I still have the crew rehearse, for later on. We never stop rehearsing. It was an ongoing thing from the day I started until the end of the film, rehearsing stuff and trying new stuff out, to see if we could work it into the film. I mentioned the opening sequence before, particularly the shot with all of the actors together. Was there anything particularly challenging about that whole sequence that you maybe weren't expecting? Greg Powell: All of that stuff, it all comes down to rehearsal, fight rehearsals, wire rehearsals. The challenging one for us was the sequence in the church, where you have all the characters in one place, and the church is being attacked by Ultron. To do that with all of the major actors in one scene, was difficult, but you had to be on your toes that day. Can you talk about working with Joss Whedon and his approach to the action and the stunts, compared to other directors you've worked with? Greg Powell: Well, Joss is a marvel you know. His ideas are just brilliant. You listen to it and you have to go over it a few times in your head. He sees it really in a different way, so you try to get that out of him. We tried stuff and showed him, and there are these little things that he's looking at that helps all of the action in the film. Is there a particular cast member that you would say takes to this type of work, in a way that you weren't expecting? Greg Powell: I think it was between Chris Hemsworth and Chris Evans. They were very busy on this one, I'm not saying the others weren't, but they really got into it, and Hawkeye (Jeremy Renner) as well. We talked to him a lot about what he was doing with a bow and arrow and stuff. It was just about bringing stuff out that he had not done before. Is there anything that you're working on now that you can talk about? Greg Powell: No, I've been working in India at the moment. I've been directing second unit on an Indian film with Salman Khan. It's Bollywood. I've gone from Hollywood to Bollywood (Laughs). We literally just finished and I'm going to have a holiday and see what comes up. I finished another one just before Christmas with Michael Apted, a film with Noomi Rapace and Michael Douglas. I was the second unit director on that, a film called Unlocked. I'm not sure when that's coming out, but hopefully that will be a nice film. Do you have any aspirations to transition from second unit to directing a feature in the near future? Greg Powell: No, I'm quite happy doing my stunt work and second unit. If one comes along, that's something I want to do, I would certainly consider it, but at this present time, I'm very happy doing stunt work and second unit directing. Marvel has a massive slate of Phase Three projects lined up. Have they been talking to you about coming on board for any of those? Greg Powell: At this moment, I just spoke to my agent and I'm sure he's speaking to them, but at this moment there is nothing going on. There has been a lot of talk about safety on the set, after the death of Sarah Jones last year. Is there anything specifically that hasn't been addressed in the past that you think should be brought to the forefront? Greg Powell: The thing that I think should be addressed is hours, the working hours. Especially over here, (in the U.K.), I don't know what it's like in the States, but they are so strict on health and safety, but the one thing they never talk about are the hours. Yeah, I know most films go 12 hours, but others have a lot longer days. Greg Powell: Yeah, but that's not too bad. It's when you go in and do 15 or 16 hours, and then you have an hour drive home, and then you have to be back in the morning. They need to address that. Is there anything you'd like to say to fans who will be revisiting Avengers: Age of Ultron for the second time, is there anything you'd like them to take notice of, as far as your work is concerned? Greg Powell: I just hope everybody enjoys it and they especially enjoy the stunt work on the film, and I'll be pleased with that. Avengers: Age of Ultron debuts on Blu-ray 3D, Blu-ray and DVD October 2, and you can currently pick up this superhero movie on Digital HD formats. Are you looking forward to revisiting this blockbuster superhero sequel from the comfort of your own home this weekend? Let us know what you think, and stay tuned for more updates on Avengers: Age of Ultron and the rest of Marvel's highly-anticipated lineup.